Alda is talking with student, Alex Spieth, who was the subject of one of the experiments in the scanner, in the main story photo. As brain imaging techniques advance, their potential influence on criminal justice is becoming increasingly evident. 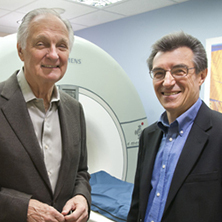 An innovative two-part series, “Brains on Trial with Alan Alda,” airing from 10 – 11 p.m., Wednesday Sept. 11 and 18 on PBS, will explore how brain imaging has the growing ability to separate truth from lies — even decoding people’s thoughts, intentions and memories — and may radically affect future judicial proceedings. Carnegie Mellon University’s seminal neuroscience research that combines brain imaging with machine-learning techniques to identify a person’s thoughts and emotions will be featured in part two of the series, “Deciding Punishment,” on Sept. 18. Marcel Just, the D.O. Hebb University Professor of Psychology in the Dietrich College of Humanities and Social Sciences and director of the Center for Cognitive Brain Imaging (CCBI) at CMU, sees brain research playing a role in courtrooms because the judicial process often includes not only what an accused person did, but also what he or she was thinking when they did it. “Did the perpetrators fear for their life, had they premeditated their actions, did they feel remorse? These are all mental states that are on the verge of being identified via their brain activity signatures, at least at the time when the thought occurs,” Just said. “It remains a major challenge to identify a thought that occurred in the past. When that capability is developed, it will revolutionize forensic science. It will become ‘CSI-fMRI.’ This research opens a new world of possible evidence for assessing a person’s responsibility for their actions,” he said. “Brains on Trial” centers around the trial of a fictional crime: a robbery staged in a convenience store that has been filmed by the store’s security cameras. As the trial unfolds, Alda visits with leading neuroscientists whose research has begun to influence court decisions. CMU’s Just, Tom Mitchell and Karim Kassam spent a day last spring explaining and demonstrating their “mind reading” research to Alda, specifically how they use functional magnetic resonance imaging (fMRI) and machine learning to measure brain signals to precisely identify a letter a person sees and the emotion a person experiences. Filming took place in CMU’s Scientific Imaging & Brain Research (SIBR) Center, which uses cutting-edge imaging and computing technology in cognitive, developmental and social neuroscience research.